Spencer Liverman (left) and Thinh Nguyen (right) are co-principal investigators with Arun Natarajan on a Navy contract. E-Lambda LLC, an Oregon State University spin-off, was just awarded a Navy Small Business Innovation Research contract for $225,000 to develop a high-speed, secure, wireless communication system for underwater platforms. Alan Wang, associate professor of electrical and computer science in the College of Engineering, co-founded E-Lambda LLC with his graduate student, Jyotindra Shakya, to commercialize research from the Engineering Photonic Research Laboratory. The Navy contract is the first project for E-Lambda. The principal investigator for this Navy SBIR project is Spencer Liverman, a Ph.D. student in in Dr. Wang’s group. 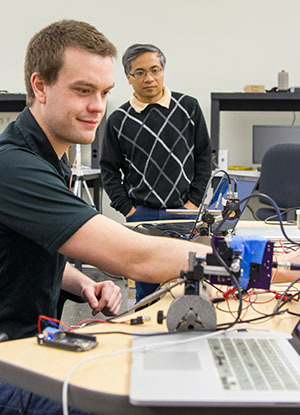 Thinh Nguyen, professor of electrical and computer engineering, and Arun Natarajan, associate professor of electrical and computer engineering serve as co-principal investigators. For the network they will be developing free space optical technologies, using lasers to transmit high-speed data. Potential commercial applications include an alternative to Wi-Fi, smart-home technology, and secure communication infrastructure for governmental agencies such as FBI and CIA.